Manitowoc, WI- Proper aeration is the critical first step in achieving high quality water. A well engineered aeration system will result in low algae levels, a reduction of pathogens in the water, higher dissolved oxygen levels, increased water clarity and an elimination of odors. Whether using the water directly without further treatment, or treating the water, the quality will be dramatically improved with a properly engineered aeration system. Micro-diffusion Aeration Systems utilize extremely small air bubbles to both oxygenate the water and gently turn the water in the pond. Turning the water gently ensures that the pond water is homogenized and evenly oxygenated. While rapidly and forcefully stirring the pond can reduce algae, it will also lift sediment into the water. Slowly turning the water in a pond will create a more gentle flow, evening the temperature and water quality without increasing the levels of sediment or turbidity. DRAMMwater Micro Diffusion Systems are fully engineered and take into account pond dimensions, depth, water temperature and a complete water analysis. Proper design and installation of these systems ensure that your pond will be as clean and clear as possible. 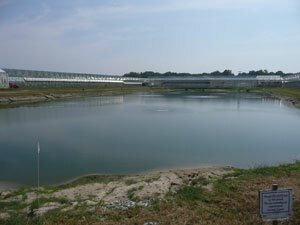 Contact DRAMMwater to learn how we can engineer clean pond for you. DRAMMWater is a newly formed division of the Dramm Corporation. Focusing on water treatment for horticulture, DRAMMwater uses an engineering based approach and the science behind it to provide complete water management solutions customized to each unique situation. For more information on the DRAMMwater or pond aeration please contact Al Zylstra at Dramm.